Granite is acid igneous rock mainly having the following composition Feldspar, Quartz, Biotic or hornblende with little iron magnesium silicates. Its colour mainly due Feldspar. Hardness Hardness of granite is in between 6/7 mho scale, as percentage of quartz increases hardness. Density It’s density is between 2.65 to 2.75 for coloured granite and more than 2.75 for black granite. Roughly, 1 cu meter block weight 3 mt. 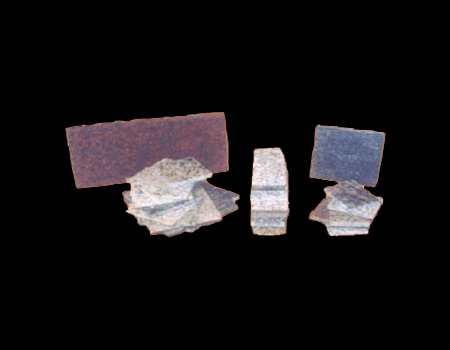 Process Tiles are processed indigenous machinery having diamond wheels and kerosene as a coolant, from raw black of granite. It is cut on slicing machine with required thickness, then it is given size on edge cutting machine. Sized tiles are then mirror polished on lapping machine. Size Granite & marble tiles are processed in standard sizes of 6”X6”, 1ft X 1ft, 2ftX1ft, 2ftX2ft. Thickness Granite & marble are having very good compressive strength and hence even thin tiles can take heavy load. Generally 10mm, 15mm, 20mm, 30mm thickness is processed. Shades In granite: Ruby red, Jalore Pink, Imperial red, Mokalsar green, Hassan green, Jet black, Silver, White, Chima Pink, Raniwara etc. In Marble pure white, Yellowish, gray, black, tiger skin, zebra etc. Granite & marble tiles are packed in wooden carats. Tiles are stopped first and then put on boxes. No loose tiles thus practically no breakage. Boxes are again strapped. Weight of packed box is 20 to 25 kgs each only. Handling is easy, care can be taken by transporter. These mirror polished thin Granite & marble tiles can be very well fixed in temple, mosque, churches etc. where people moves without shoes. Apply cement paste at the back of tiles and fix unleveled floor. Please remove paste from tiles edge before putting nest by the sides. It will increase the beauty of floor. Any quantity and quality available in tile, slab and block size.